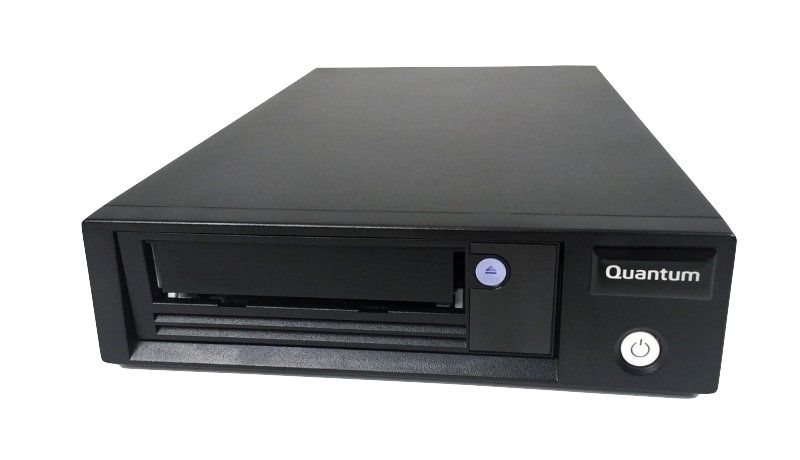 Linear Tape File System is a standard format for writing files to tape. 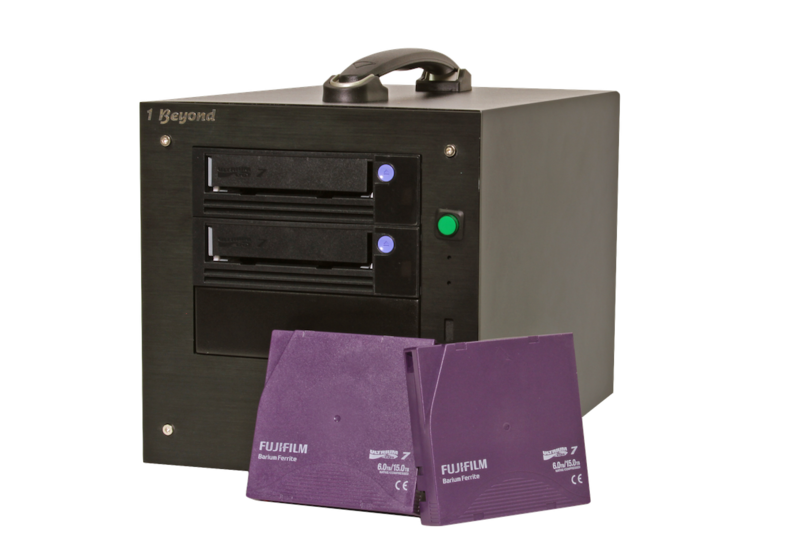 It's ideal for storing production and post media as the LTO tapes can be mounted and read on Linux, macOS and Windows. You aren't locked into a proprietary archive. 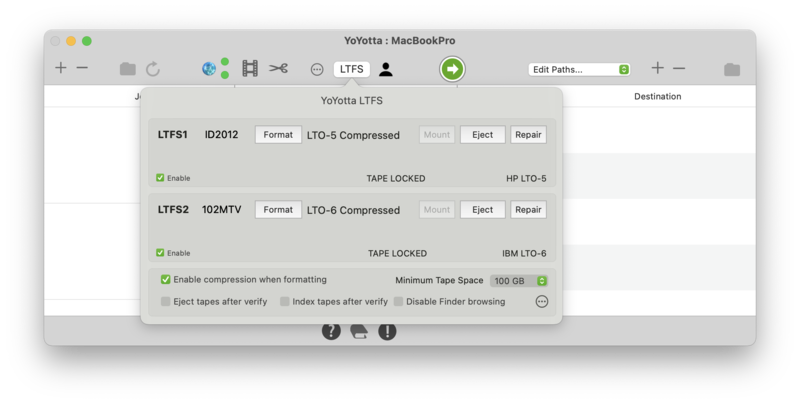 YoYotta LTFS includes all the features of YoYotta and adds the ability to create archives in parallel to two standalone LTO drives using LTFS. 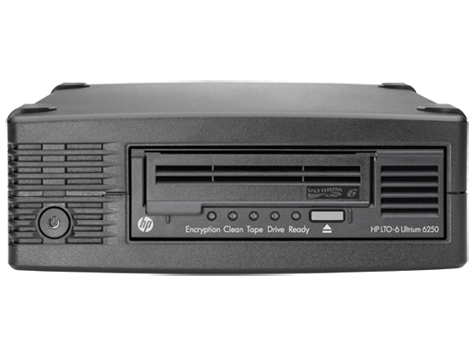 Quickly create industry standard archives on LTO-8, LTO-7, LTO-6 or LTO-5 tapes. YoYotta names, formats, mounts and repairs tape archives. During the archive YoYotta calculates both MD5 and xxHash checksums and then automatically uses these to read back and verify every file. YoYotta remembers the contents of every tape created so later on you can search to find the location of shots. Unlike hard drives the tapes are designed with a 30 year shelf life. All tapes must have barcode labels, this identifies the tape and allows use in a library. 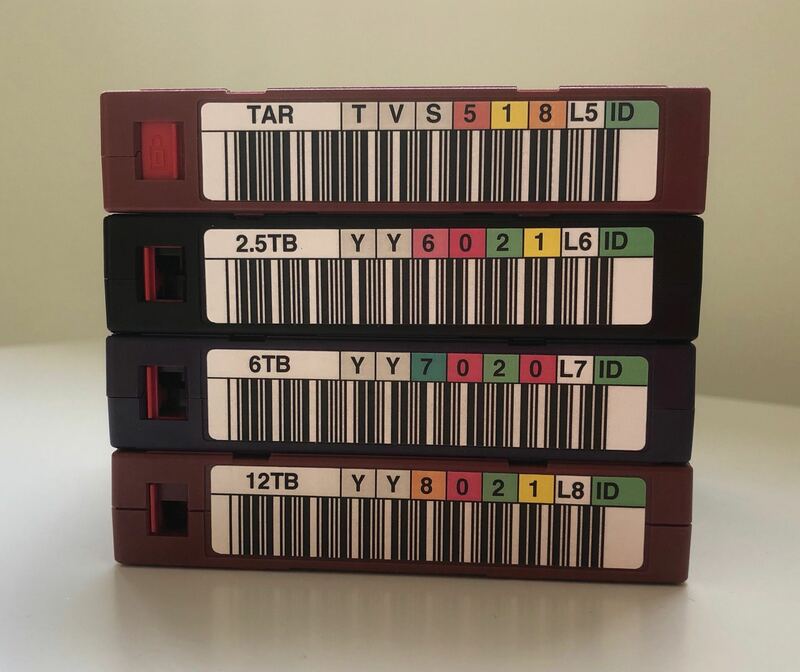 We can supply LTO tapes in Europe at great prices with custom YoYotta ID labels printed on durable plastic. They have a standard barcode, plus a globally unique NFC chip that allowing easy tracking. You can add unique text labels on the left as shown opposite. So you can clearly label Master and Safety, or add a project ident. Unlike other labels each tape can have a different code, you are not limited to a set sequence. Contact support@yoyotta.com for a quote. YoYotta has a smart queue, so multiple copies to tape can be started and they will be processed in order. 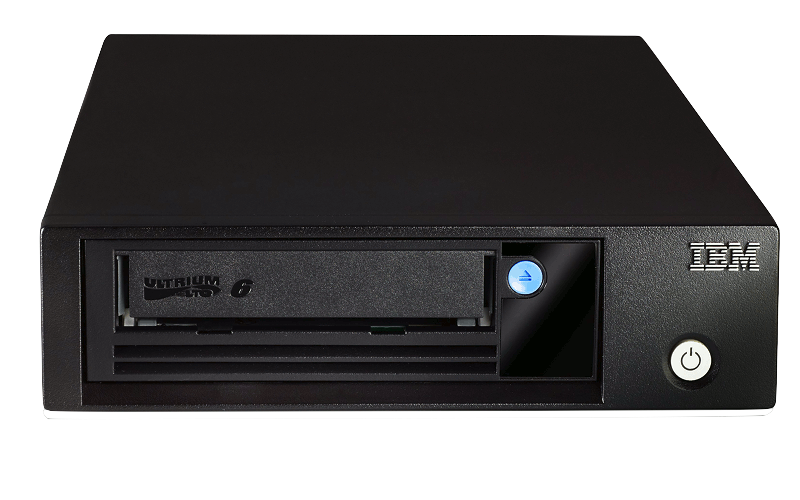 The LTFS standard requires an LTO-8, LTO-7, LTO-6 or LTO-5 tape drive. LTO drives have either SAS or Fibre Channel interfaces. We suggest SAS it's cheaper, uses more durable cables, there is no configuration and it gives the same performance. To connect a SAS or FC LTO-5, 6, 7 or 8 drive to a Mac use the ATTO ExpressSAS H680, H1280 or ATTO Celerity FC PCIe cards from ATTO. H644 and H608 cards can also be used, but ensure they have the correct SAS connectors for your drive. 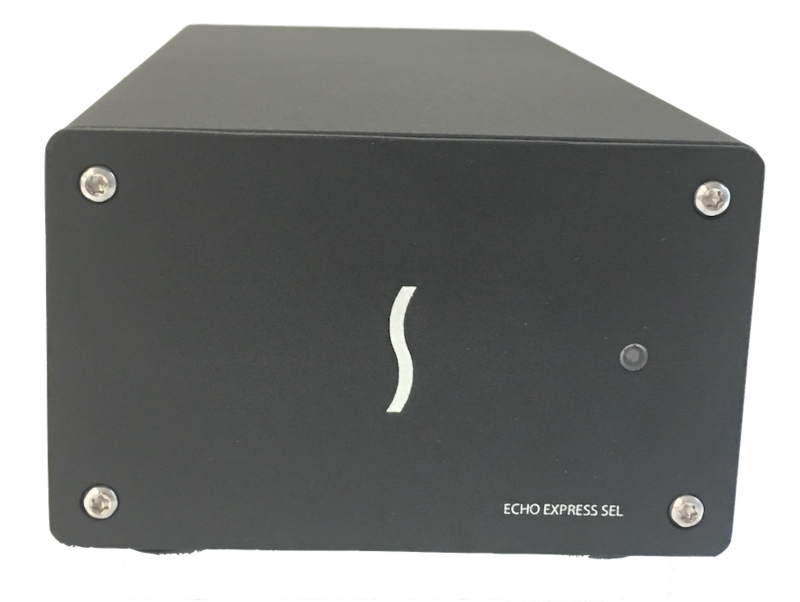 These PCIe cards can go in a Thunderbolt expansion like the Sonnet Echo Express SEL shown here. Alternatively you can fit the PCIe card inside an older MacPro. However even the entry level Mac mini will give better performance and will save you a lot of electricity ! There are also units from 1 Beyond, MagStor and mLogic that include an internal Thunderbolt to SAS adaptor so they can plug straight into a Mac. There is also a Unitex unit that has an internal USB3 to SAS adaptor. ATTO Thunderlink SH1068, SH2068 TB-SAS, ThunderStream SC4808 adaptors, R680 or R644 PCIe RAID SAS cards do not support TLR which is a required protocol. So they are not compatible with LTFS running on any operating system. Portable unit with a Thunderbolt interface. Can hold one or two LTO drives. With two drives and YoYotta LTFS you can make master and safety LTO tapes in parallel saving a huge amount of time. 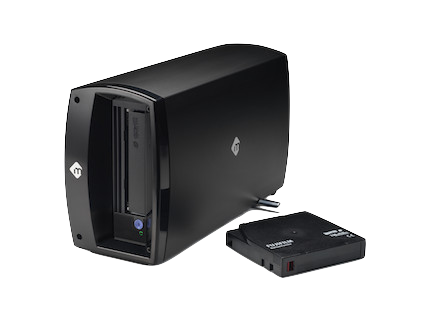 IBM LTO drive with a Thunderbolt interface in a compact enclosure. The mTape will connect directly to the Mac. It also has a SAS output to allow the easy connection of a second drive.